Popular Galactic Gravity Golf game now with new levels. New levels, new music, new havoc to wreck on the golf course! 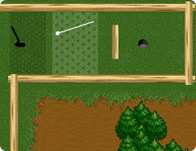 Original golf game where balls were replaced with discs. Click and drag to adjust the power. Golf Gavin with a new course, music, and players. You are a cat with a bow and arrow. Hit the target in the fewest shots. Have you ever played golf in space? If no here is your chance. Your objective is to play a pre-historic round of golf with your trusty catapult through a Jurassic landscape. 18 holes in total, each getting more difficult than the last. The golf cource in trouble again because, Gavin is back! Run, Jump and swim through 5 different golf holes as Gavin the Goblin. Golf Goblin is having a few rounds of golf at the same time. Can you help him to get out of the trouble? Great 3D golf game. Putt your way through 18 unique courses. The big hairy elephant that taught Tiger Woods how to play golf returns in the craziest minigolf game ever! Set a rotation speed of the green and try to get a hole in one. A great time waster mini golf game. This is another different and challenging version of mini golf. Play 18 holes of minigolf in the garden park. Gravitee is basically golf in space! Using (tweaked) Newtonian physics, get the ball on one planet through the gate on another planet. A mini golf game. Try to get the lowest score in each round. A point and click game where you have to get your ball to the goal within a certain amount of pars.